Charge and sync your Apple devices in their protective cases, even in hard to reach areas and tight spaces. The USB2ADC1MUL Apple (30-pin) Dock Connector to Left Angle USB Cable for iPhone, iPod and iPad (1m) offers a simple and reliable solution for connecting iOS-enabled mobile digital devices to your computer, for syncing or charging.The left-angled USB connector allows for connection in tight spaces while the stepped Apple Dock Connector, designed by StarTech.com, plugs into your iPhone, iPod or iPad even when inside a protective case, avoiding the inconvenience of having to constantly remove the cover for every charge.As an alternative, StarTech.com also offers a 1m Apple 30-pin Dock Connector to Right Angle USB Cable (USB2ADC1MUR), which provides the same convenience as this left-angled cable, but allows you to connect to your PC or Mac computer or your USB wall/vehicle charger from the opposite direction.Note: If your computer USB port does not deliver sufficient power and you see a "Not Charging" message on your iPad or other Apple device, you can use this 1m 30-pin Dock to USB Cable with the USB 2.0 Fast Charging Adapter (USB2CHADP) in order to fast charge your devices. This 3.3 ft / 1m Apple 30-pin Dock Connector to left-angled USB Cable is perfect for all your office needs. The left-angled USB connector is convenient for connecting to your PC or Mac computer even in hard-to-reach areas and narrow spaces - keeping your connections organized and tidy. The stepped connector design allows you to plug into your iOS-enabled device even while inside a protective case. And the standard length makes it a perfect replacement for your damaged or misplaced iPhone, iPod, or iPad cables. Our complete selection of USB-to-Dock Connector cables for Apple makes it easy to charge or sync your iPhone, iPod, or iPad in all situations. We offer a wide selection of unique cables in a variety of lengths, short and long, including angled cables, to suit any application perfectly. All of our 30-pin Dock Connector cables are certified to Apple MiFi Standards and are backed by our lifetime warranty to ensure dependable performance. 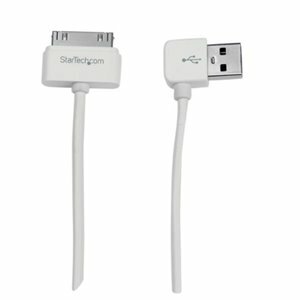 See below for our full selection of iPhone, iPod, or iPad cables to meet the needs of your different applications.